Make sure the Garcinia supplement you take passed our tests and is right for you! Garcinia cambogia extracts are popular weight loss supplements, but few products on the market actually provide the amounts of hydroxycitric acid (HCA) typically used in clinical trials and most don't even contain the amount of HCA listed on their labels. 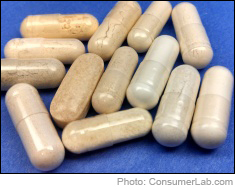 Among 13 Garcinia cambogia supplements which ConsumerLab.com selected for review, seven contained only 14% to 81% of the listed amount of HCA, a plant compound believed to be important to Garcinia's biological effects. Even among products which contained what was listed, the amount of HCA in a suggested daily serving ranged from as little as 250 mg to 3,150 mg of HCA, while the dose typically used in clinical studies is 900 mg to 1,500 mg of HCA. Two of the products which failed testing provided less than 100 mg of HCA per day! Unlike OTC products and prescription medications, where dosing must be approved by the FDA, dietary supplement companies set their own suggested serving levels, which may or may not correspond to what has been shown to work. Among the six products which passed testing, the cost to obtain an equivalent amount (1,500 mg) of HCA ranged was as low as just 74 cents, but among products which did not contain what they claimed, this cost was as much as $21.41 based the amounts of HCA actually found. You can use this information to find the best Garcinia cambogia supplement at the lowest cost and avoid getting ripped-off. You must be a ConsumerLab.com member to get the full test results for Garcinia cambogia supplements along with ConsumerLab.com's recommendations and quality ratings. You will get results for 13 Garcinia cambogia supplements selected by ConsumerLab.com and for four others which passed our voluntary Quality Certification Testing. You'll also get information about a product similar to one that passed testing but which is sold under a different name.